After his success at the seventh edition of the OPEN International Exhibition of Sculptures and Installations, Li Chen returns to Venice Lido with a large-scale sculpture entitled “All in One”. Li Chen’s expressive research has developed over the years with a singular, stubborn coherence. Cultured and sacred, it concentrates on themes to define space, to measure its volumes. His influences may appear evident, but in fact the dilated forms immediately take on a new “pathetic” value, as itineraries within the soul which has had to express itself in this way. The pathos that moves his art, rich in fascination, in memories and different kinds of seduction, religious and literary, philosophical and figurative, could not be expressed in any other way. It needs to leave a trace not only in the manipulation of masses of bronze, but on the whole surrounding space, it needs to be transformed into a “grand machine for producing theatre”. Li Chen feels that Buddhist iconography has a significance that must be probed with sharper and more penetrating means, a significance which is like a secret rising agent, something moving deep inside, dilating and taking shape in palpitating expansion, ready to be renewed in order to celebrate a new representation linked to modern thought. 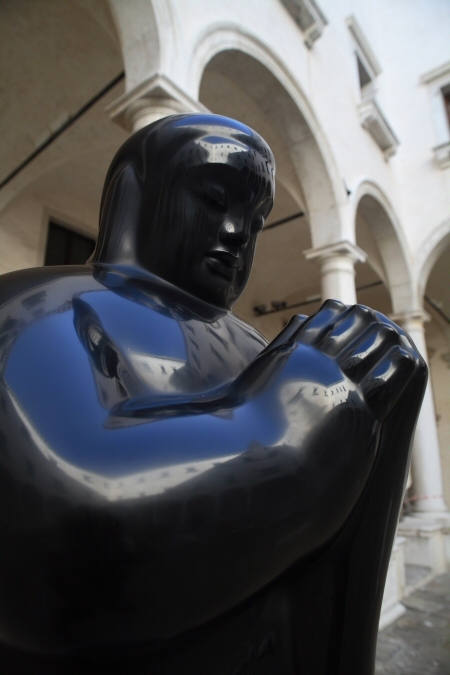 The accepted meaning of “swollen forms” refers to the artist’s ability to give a vital expansion to the bronze mass and, more precisely, they invoke the purely contemplative and emotional aspect where the plastic game takes on dreamlike elements that rise to the surface through memory and consciousness, thus arriving at a lyrical and poetic language. The works in the ‘Bodhisattva’ cycle present the most important moments in this search for authentic, living “monumentality”. Because, indeed, the works must strive to be “monuments”: they must invite us to remain, to resist, to meditate. They must all possess the necessary persuasive strength to achieve this.